(Bloomberg) -- The equity strategy Wall Street loves to hate has a new fan. 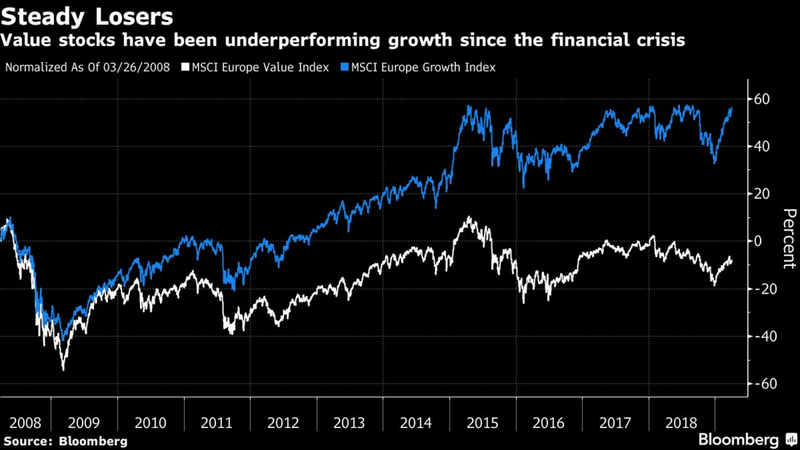 In an environment of sinking bond yields, European quantitative analysts at Morgan Stanley are going against the grain by recommending value shares with high payouts as an alternative to everyone’s favorite quality stocks. While a rush to safety has boosted quality’s valuations to the 99th percentile of the past 30 years, high dividend payers remain stuck in the 10th percentile of historical valuations. That gap has led Morgan Stanley to wager that cheaper stocks with generous payouts are better placed to benefit from low bond yields than shares with stronger balance sheets and corporate management. “Going forward, we think high dividend yield stocks are better positioned to benefit from low bond yields compared to quality as their valuations and performance trends look less stretched,” wrote Morgan Stanley strategists including Krupa Patel and Alix Guerrini. What’s been luring traders to quality and growth stocks is that over the past decade, these groups had the highest negative relationship with bond yields. But, according to Morgan Stanley quants, over the past 30 years it was defensive value shares that displayed the strongest inverse correlation with debt yields among other factors. The U.S. firm joins other contrarian quant whizzes, including Sanford C. Bernstein, in favoring a strategy that has trailed the market during every year but one since 2006. But as investors have swelled the valuation of companies that boast low volatility, value is attracting the interest of more and more strategists. Barclays Plc’s Emmanuel Cau says that the safety trade of quality and growth stocks looks “crowded and expensive,” and it might not take much of a bounce in bond yields to fuel a switch into value. 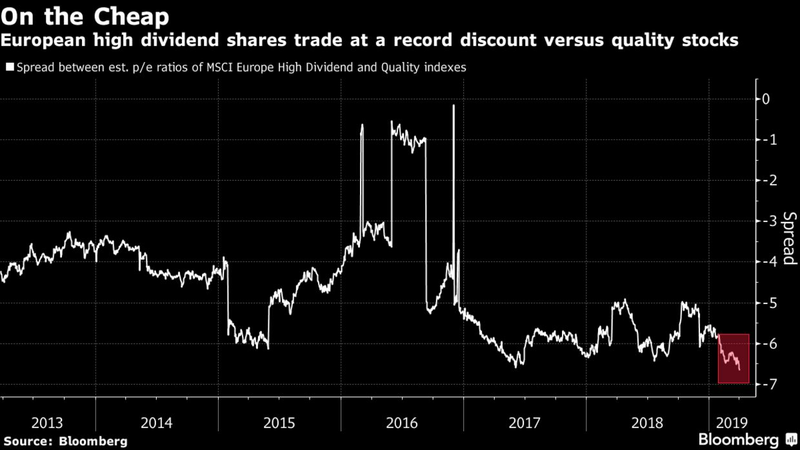 Goldman Sachs Group Inc. is also a fan of high-dividend paying shares in Europe and says that investors will reward stocks able to generate growth rather than pure defensive strategies. Among sectors, Morgan Stanley is keenest on banking stocks since it expects German bund yields to rise later this year. Lenders have the best mixture of high dividend yields and the strongest correlation to bund yields, it says. Inexpensive equities with higher dividend yields have this year continued to lag behind higher-rated peers that boast strong earnings potential. Easing economic momentum doesn’t bode well for value sectors that are cyclical like financials, and tends to favor those with strong cash flows such as growth companies. But for European equities, which struggle to attract investors after being hit with the largest fund outflows this year, generous payouts are sometimes the only way of standing out among other regions. U.K. and European dividend yields are the highest in the developed universe after Australia, according to Morgan Stanley. “An important reason why we like buying dividend stocks is because the market’s dividend yield is too attractive to ignore both on an absolute basis and relative to government/corporate bonds,” the strategists said.